The demand the huge Atlantic Coast Pipeline was intended to meet is disappearing, according to documents from the corporations behind the project. Dominion and Duke Energy own almost all of the pipeline, as well as the electric utilities it would supply with natural gas. 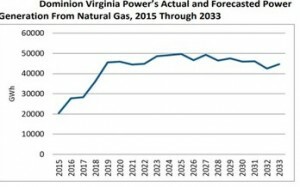 When applying for a federal permit, they argued it was needed to meet rising electricity demand in North Carolina and coastal Virginia. But Cathy Kunkel, an energy analyst with the Institute for Energy Economics and Financial Analysis, said utility filings in those states now show the outlook has changed dramatically – in part because of competition from cheap, renewable energy. The energy companies say they need more pipeline capacity to move fracked gas out of the Marcellus and Utica fields of northern West Virginia, where the price for it is artificially depressed by a transportation bottleneck. flat for the next decade and a half. The 600-mile pipeline across the three states has faced a number of setbacks, including lawsuits by landowners and conservationists. It was recently announced that the total cost of the project would rise to $7.5 billion, and its opening would be delayed until 2021. If the builders can get state utility regulators’ approval, they can shift the full expense of the line onto ratepayers, along with a guaranteed profit. But Kunkel said investors in the utilities may be starting to worry about the financial risks. Kunkel said the incentives tend to make utilities and pipeline companies overestimate demand and overbuild capacity. She said that’s becoming a more serious issue as climate change poses increasing risks. Kunkel helped write the analysis for a report from IEEFA and Oil Change International.